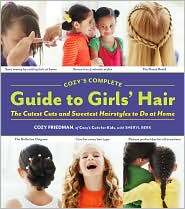 In celebration of her highly anticipated debut book, Cozy’s Complete Guide to Girl’s Hair, kids' hair expert Cozy Friedman opened the doors to her flagship Madison Avenue salon for a chic and kid-friendly evening of fun. Guests sipped on delicious drinks provided by Arizona Teas and Frey Wines, while kids received signature hair styling from Cozy’s talented team of experts. Guests left with a fabulous gift bag featuring items such as So Cozy hair care products, Sally Hansen Salon Effects Nail Polish Strips, a gift card from The Children’s Place Bliss Lotion, and an earth-friendly notebook from EcoJet.